‘French’ style of interior design cannot simply be encapsulated into one interior style. Whether your enamoured with Classic French Interiors, French Mid-Century or even the lesser know French country Design, there is something for everyone. Here is a French Interior design style guide that adds character to any home with je ne sais quoi..
We can take a few tips from the three major french interior design moments, while still preserving a sense of understated elegance combined with a nod to a great sense of style as well. 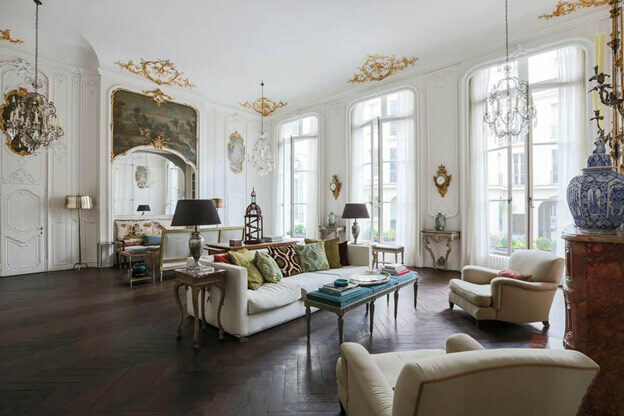 While many people think that the French style is too ornate to fit today's tastes, there are other variations in the French style interiors that cater to different outlooks. The timeless beauty of the Classic french Interior design contains ornamentation at its finest. There is a timeless elegance and essence that the quality of French antiquites can offer. 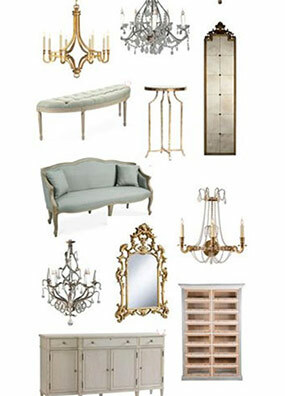 Part of the parisian style home is the story behind the furniture and decor. Here in this style, gold, is synonymous with luxury, so incorporate gold. Whether its a sofa or the ornate plaster of paris designs in the ceiling. Use gold to set off the detailing against a classic white background, along with gold coloured framed mirror to add extra charm. There is nothing more french than antique gold framed art along with long elegant drapes, encompassed with antique accessories. Be prepared to see a vast assortment of mixed metals, integrated color combinations and luxurious textures. Other features to include would be to intricate moulding,and if you want to take it to the next level, add a statement ceiling medallion. This type of french interior is not for the faint of heart, but is sure to make a bold statement. Mid-century is a specific style of interior where there are a lot of pared down design additions with subtle details in design. There is an emphasis on function with simple forms and organic influences such as arches and curves. 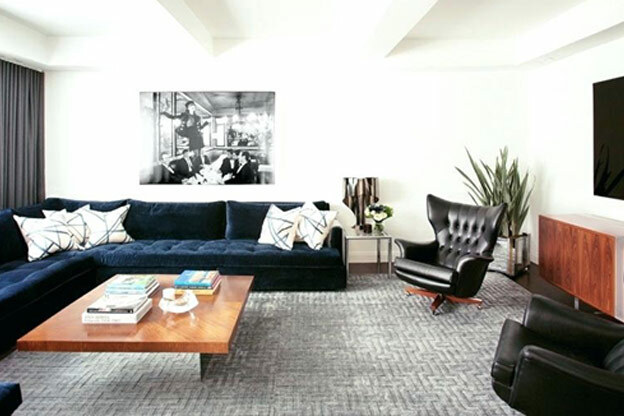 The common elements of mid-century modern design includes a balance between elegant design with patterns paired with muted colors, often keeping function foremost in the design. French styles here would include pastel colors and other muted color palettes to create a calming interior with contrasting deep shades. When looking to inculcate mid century furniture, opt for a classic like a solid wood credenza. And vintage pieces which are made for function, like arm chairs with matching wood are great beginner investments. 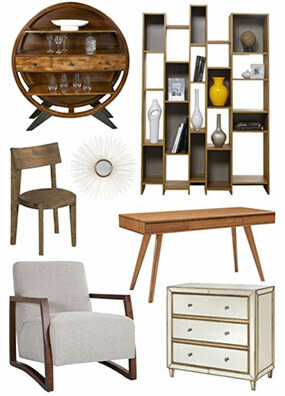 Use a combination of these two styles and you get a French mid-century modern space. 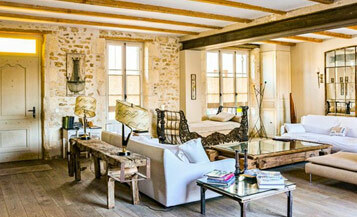 Rustic French interiors at their best, and a style which is reminiscent of the old world french homes. 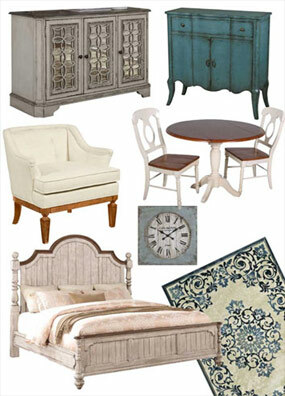 Paired with rustic features and french styling to exude a urban space that feels like a old french countryside. Architectural features such as stone walls and raw wood floors, to distressed timbers with irregular plaster lend to that classic old-world look. The style and decor fit well into urban houses, and will fit beautifully into your home as well, but incorporate these rustic features in layers and your bound to have a more welcoming classic look instead of an overdone rundown look. When it comes to the furniture, hand carved decore and raw wood, with detailed chairs and occasional chairs to accent a room with are the right direction. With this interior style it all about detailed decor with white washed details as well as shabby chic exposed brick walls. In many parts of the world, multiple generations living in one house is common, if not the norm. While there are many builder derived solutions to housing the young, middle aged, elderly and everyone in between under one roof. There are also many ways you can customise a home to complement your family keeping a few of the things we have mentioned above in mind.